Ottawa School of Art in partnership with Ottawa 2017, Ottawa Community Housing, Embassy of Imagination, and the City of Ottawa. Illunaata which means “all together” in Inuktitut, is a celebration of Canadian imagery and community through the medium of paint. To mark this momentous year, The Ottawa School of Art (OSA) has partnered with Ottawa 2017, Ottawa Community Housing (OCH) and the Embassy of Imagination (EOI) to create a series of murals that are universally accessible, promote diversity, respect, positivity, and speak to OSA’s motto, “Teaching Art to Everyone” by sharing art with everyone! There will be 4 murals created in total, painted through May-July 2017. 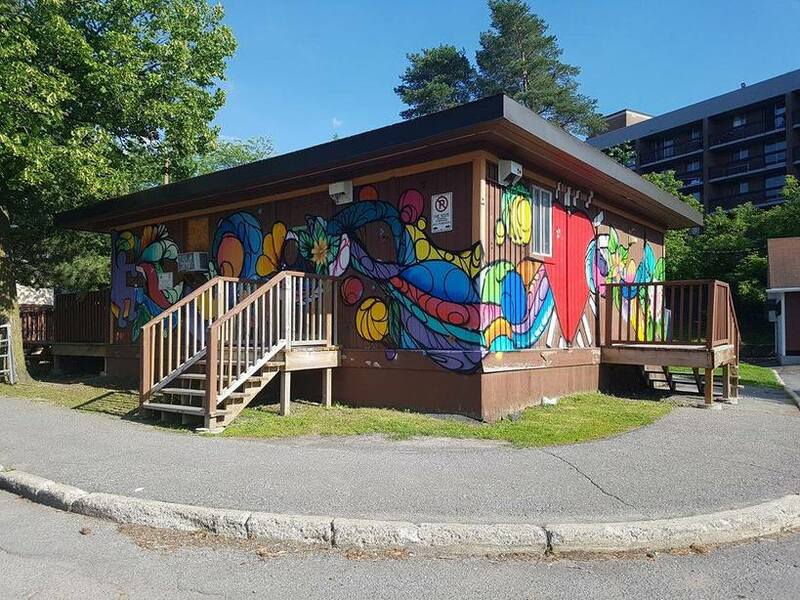 Three murals will be painted for Ottawa Community Housing and the largest will be done by youth from Cape Dorset, Nunavut. Youth from Nunavut will join us in July 2017. There will be 3 teams of OSA members working on the murals for OCH. The murals for OCH will portray images and symbols from their respective neighbourhoods with community consultation. There are 3 sites spread across Ottawa South, Lowertown and Centretown. The artists painting the OCH murals are Emily Rose, Clare Brebner, Yulia Lisitsyna, Patricia Smith, Dominique Boisvenue, Alex Aimee Rivet, Anne Bell, Maya Hum, Faheem Khan and Jasmine Cousineau. The youth from Kinngait (Cape Dorset, Nunavut), Christine Adamie, Janice Qimirpik, Kevin Qimirpik, Harry Josephee and Parr Josephee along with their friend and chaperone Joseph Pinguartuk are guided by Alexa Hatanaka and Patrick Thompson: Embassy of Imagination. Their dream wall has been 87 George Street (Bell Media building) and we are thankful to Bell Media for allowing us to display this mural on their property. 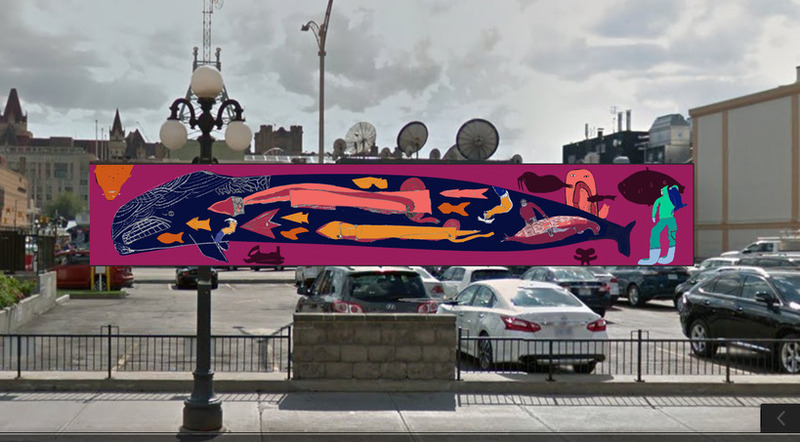 This mural, titled Tunnganarniq, which means “fostering good spirits by being open, welcoming and inclusive” will take Inuit art out of the galleries and into a public space. Photo and video documentation of Tunnganarniq is also being be presented at the Art Gallery of Ontario as part of PA System and Embassy of Imagination’s installation Towards Something New and Beautiful + Future Snowmachines in Kinngait in the group exhibition of Canadian Art, Every. Now. Then: Reframing Nationhood, June 28 – December 10, 2017. The project will give youth a voice and it will instigate dialogue around the next generation of Inuit artists. Illunaata will provide an unparalleled opportunity for Nunavummiut youth artists that lack access to arts programs, and it will rejuvenate the artistic and cultural exchange between “the north” and “the south.” The imagery is created by the youth, and will be painted by them as well. Illunaata will commemorate Confederation by showcasing Canadian values and aspirations, with a uniquely Inuit mural and 3 other murals inspired by the people of Ottawa to add to Ottawa’s growing collection of public art. Illunaata will be a vibrant step towards the future. We are excited to collaborate with these organizations to bring Canadian colours to the walls of Ottawa and share dynamic Canadian stories, histories, and visions through the medium of paint. We are very grateful to Ottawa 2017 and their Arts, Culture and Heritage Investment Program for which we have received funding for this project. We are also grateful to the Herb + Cece Schreiber Family Foundation and Inuit Tapiriit Kanatami for also funding this project. 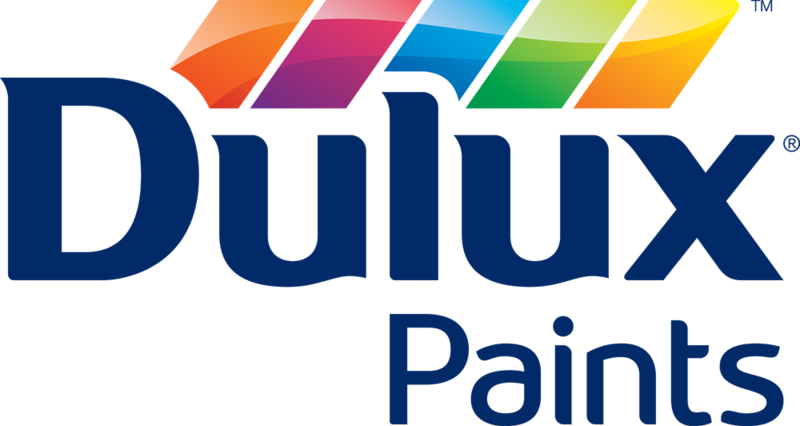 We would also like to thank Dulux Paint for sponsoring all of the paint for each mural and Van’s Pressure Cleaning Ottawa for power washing each mural site.